At the end of last session, we left our heroes battered and blooded, but still in command of the ruined church overlooking the army’s flank. For the next few hours, as the battle raged below them, they easily fended off several minor, spoiling attacks. However, late in the afternoon as the battle seemed to be reaching a climax in the valley below, a large force of Blood Moon goblins led by two ferocious bugbears and their ogre-chieftain, Ruknar, (who the PCs had first encounters in the Shadowed Keep on the Borderlands) climbed the hill to slay the church defenders. As the goblins advanced a barrage of spectacularly ineffective missile fire rained down upon them. It was only after the goblins had circumvented the various pools of oil, stands of stakes and other obstacles the PCs had created that the first arrow slightly grazed a goblin. By this time, an orc wizard had joined the attack, creeping forward slowly to support the goblins, and Ruknar had almost reached the ruins. Ruknar, angered beyond all reason by the Ironwolf symbol daubed on the ruins and warrior standing fearlessly and proudly bearing the hated Ironwolf shield, challenged Klara to single combat. However, the sheer weight of the goblins’ numbers precluded her taking up the challenge until Ruknar ordered his minions to retreat. With a curse, Ruknar hurled himself at Klara, who struck the ogre a terrific blow in return. Ruknar’s charge, however, carried him into the ruins. 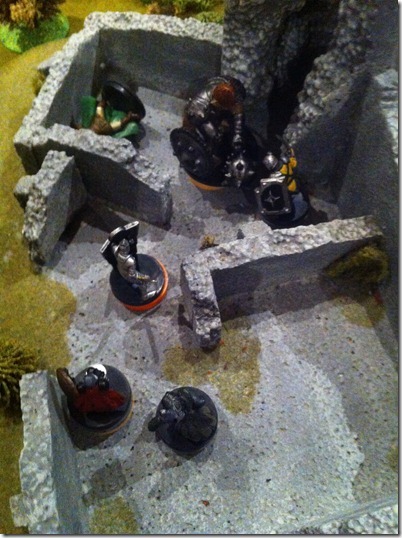 Klara retreated, trying to catch Ruknar in the party’s hastily improvised pit trap, but the cunning ogre dodged it. As Klara retreated, Ruknar called out to his wizard, ordering him to destroy the coward! A fireball burst in the ruins badly injuring Klara and several of her companions who had rushed to her aid. Garon almost died. Seeing this, Delvier quickly slew the goblin facing him and rushed to attack the wizard. He badly injured the spellcaster, but in return was struck by a bolt of fire that almost killed him! In the ruins, the battle raged on. Ruknar brought his falchion down at Klara – who seemed doomed – but at that minute a ghostly figure of a warrior emerged from the Ironwolf shield and deflected the blow! The figure surrounded an wreathed Klara – and although it did not directly attack Ruknar, it deflected several more attacks. While these individual battles were being fought out, Krotz bravely held one flank, holding off two goblin warriors while Adoven healed him and his other companions as needed. Badly injured, the wizard retreated but dropped another fireball in the ruins. This time, however, he accidentally caught Ruknar who roared in anger and pain. 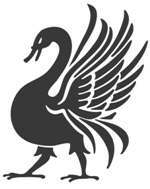 As Delvier again charged the wizard, another bolt of fire flashed past his face – barely missing the badly injured warrior. The wizard now, badly injured, fled but not before dumping another fireball in the ruins. This time he deliberately caught Ruknar who died moments later from blood loss and shock. 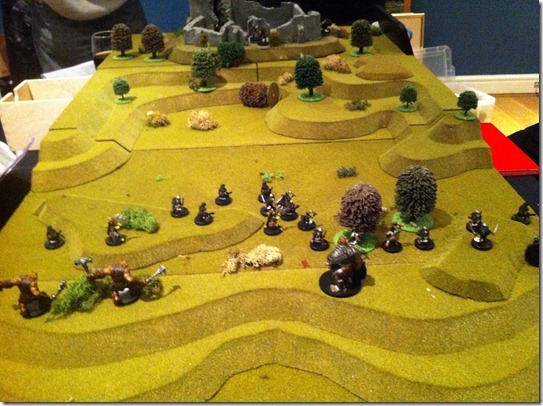 Seeing their chieftain fall and the orc wizard retreat, the remaining goblins fled down the hill. Heroically, the party followed and put the goblins to flight. Their example, spurred the other groups of Volunteer Borderers into action and they also advanced. 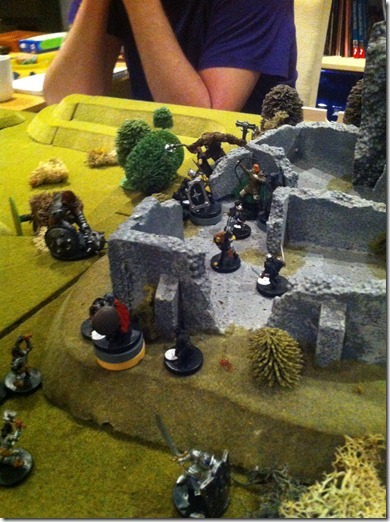 This heroic charge broke the host’s flank and as the gnomes in the valley also advanced the enemy host disintegrated. Too exhausted to pursue, the party rested, healed their wounds and began to loot the bodies of the fallen as Ratik’s victorious soldiers hacked and slashed at the fleeing orcs and goblins. In their wake, they left a carpet of dead and dying combatants. That night, Ratik’s heroes rested, ate and drank. For almost a week, the army rested around Glister. Slain soldiers were buried with honour while the fallen humanoids were burnt in huge pyres. During this time, the party’s fame spread. Many saw their heroic defence of the ruins as pivotal to the battle and Klara – in particular – was feted as now worthy of the name “Ironwolf” particularly as the ghost form of Valentin Ironwolf had been seen to help her in the battle. The Sword Lords agreed, and so it came to pass that Klara was gifted the title Lady by Bremen Leiyraghon (her new liege lord) and give the ruins of Ironwolf castle and a small portion of surrounding land as her own.